Even as the prospect grows that special counsel Robert Mueller might end up subpoenaing President Donald Trump for an interview, Trump's lawyer, Rudy Giuliani, has stopped making a key argument: that Justice Department "rules" block such a subpoena. Giuliani says his team might still make that argument if Mueller actually moves forward with a subpoena, but Giuliani's apparent abandonment of the talking point in recent interviews suggests the matter is not as clear-cut as he once made it seem. In the months after he became the president's personal attorney, Giuliani went on national TV over and over again to insist that Mueller is hamstrung by an 18-year-old legal analysis that governs when the Justice Department can pull a president into criminal matters. But in recent weeks, even as he has spoken repeatedly about the specter of a subpoena from Mueller, Giuliani has stopped making the claim, and legal experts tell ABC News the claim was always misguided. Rudy Giuliani greets President-elect Donald Trump at the clubhouse at Trump National Golf Club Bedminster in Bedminster Township, N.J., Nov. 20, 2016. Giuliani's argument was based on a Justice Department opinion commissioned by the Clinton administration in the wake of the Monica Lewinsky affair and independent counsel Ken Starr's wide-ranging probe of then-President Bill Clinton. Titled "A Sitting President's Amenability to Indictment and Criminal Prosecution," the 39-page memo from the department's Office of Legal Counsel concluded that in "balancing" the "competing concerns" of executive authority and effective law enforcement, "we believe ... a sitting President is immune from indictment as well as from further criminal process." "The [Justice Department] opinion takes the position that a president can't be indicted because indicting a president would be such an interference on his ability to perform his function," according to Neil Eggleston, a former federal prosecutor who served Clinton and former President Barack Obama during their tenures in the White House. Months ago, while publicly advising Trump against a voluntarily interview with Mueller, Giuliani repeatedly proclaimed "rules of the Justice Department" prohibit Mueller from issuing a subpoena to Trump. "Can't do it. Can't do it," he said on CNN in May. "I got the memo right here. ... End of story." A month later, in an interview with ABC News chief anchor George Stephanopoulos, Giuliani said that while constitutional questions about a presidential subpoena are open for debate and are complex, the 2000 memo was "definitive" on the matter. "You cannot indict a sitting president nor can you compel process," he said. But the actual text of the 2000 memo does "not even remotely support Mr. Giuliani's positions" because it focuses on the "process" that can happen after indictment, not what can happen during the "investigative phase" of a case, according to Eggleston. "I think no part of that opinion has anything to do with whether or not he has to respond to a grand jury subpoena," he said. In recent weeks, Giuliani has stopped citing the memo, even as he now describes constitutional questions as "clear" and vows to fight a Mueller-backed subpoena all the way to the Supreme Court. An ABC News review of Giuliani's interviews with TV networks in the past month found no instance of him citing the 2000 memo. On Fox News two weeks ago, Giuliani insisted "the Constitution is clear that the president cannot be subpoenaed." He didn't mention the 2000 memo. Asked by ABC News on Monday about the shift, Giuliani said he has not deliberately abandoned mention of the 2000 memo. "Maybe it just hasn't come up," he said. But during two separate radio interviews last week, Giuliani and fellow Trump attorney Jay Sekulow repeatedly spoke about whether a sitting president can be subpoenaed, and neither one of them mentioned the 2000 memo at all. Still, Giuliani told ABC News on Monday that if Trump is ultimately subpoenaed by Mueller, the 2000 memo "would be one of our arguments" against the subpoena, but it would not be "our only one." 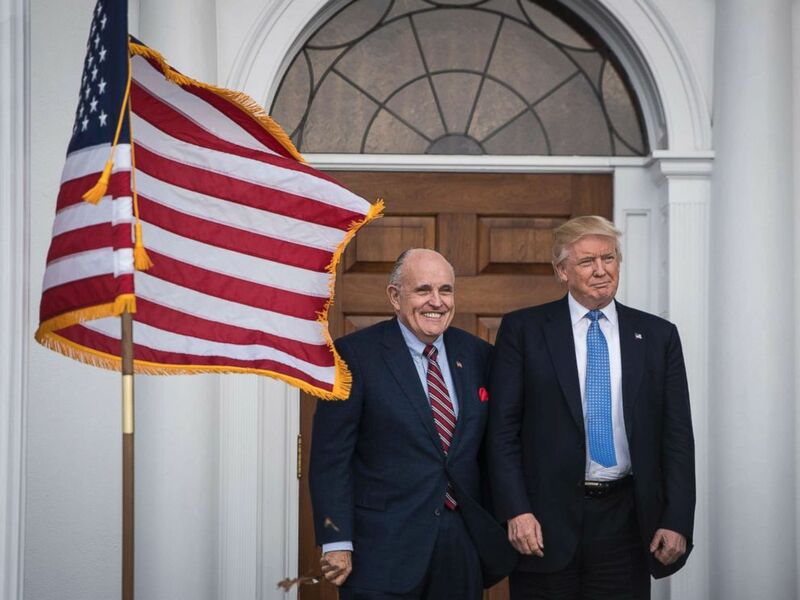 Separately, Giuliani recently acknowledged to ABC News that, since becoming Trump's attorney, he has espoused a number of positions that seem to belie the stances he took when he was a federal prosecutor charged with enforcing the law. For example, even though he has recently questioned the validity of Mueller's appointment, he once told lawmakers that if serious allegations were ever lodged against a president, the Justice Department would have no choice but to call upon a special investigator to look into the matter. "Any attorney general that did the opposite of that would not be acting sensibly and would be subject to severe public criticism," he told a Senate panel in 1982.